The St. Louis Catholic School Annual Fund was established in 2011 and is an opportunity for stewardship and investment in the long-term mission of the school. Your support, and the support of our community, is crucial in advancing our mission. While school tuition income covers the immediate needs of our students and staffing, it is limited in areas of growth and renovation. Through your gifts of financial support, service and prayer, we can secure the fiscal health of the school for the future. The goal of this year's campaign is to continue the fiscal success of previous years and to improve upon our number of participants from our school community, parish community and school alumni. We hope to raise $75,000 to replace the original interior classroom doors in the main building for greater quality and security protection and upgrade all classroom door locks for quick lockdown procedures in both campus buildings. Additional funds will go toward the purchase of chromebooks and tuition assistance for families with significant financial need. 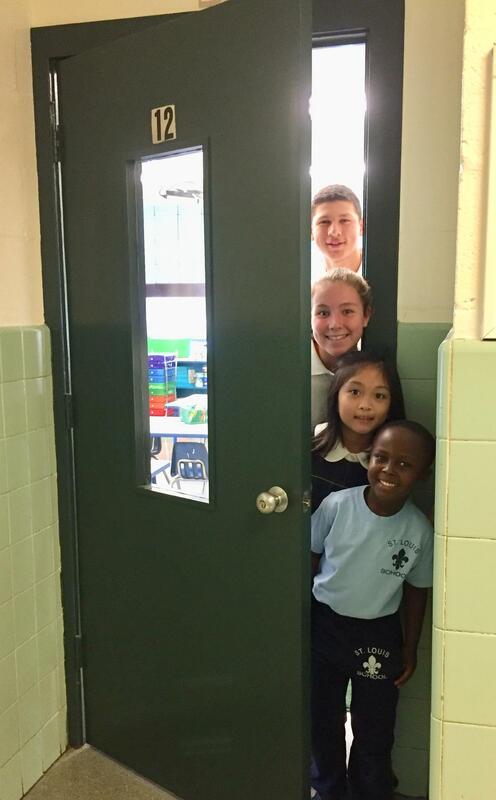 Your gift to the St. Louis Catholic School Annual Fund may be given at any time. Credit card payments are accepted through the PayPal Giving Fund and FaithDirect. Neither organization charges processing fees for charitable donations so 100% of your gift is received by the school. PayPal One-time Payments - Tax-deductible monetary contributions may be made through the PayPal Giving Fund as a one-time payment. FaithDirect Recurring Payments - You must set up a secure online account with FaithDirect. Please use the code VA141 for St. Louis Church and designate "School Annual Fund" to ensure your donation is credited to the Annual Fund. Annual Fund Angel - The Annual Fund Angel giving level is an opportunity for family and friends of St. Louis to direct their gift to the full-price purchase of specific items. For the 2018-19 campaign, Annual Fund Angels may elect to fund-a-door ($2,000), fund-a-lock ($400) or purchase a chromebook ($300). Annual Fund Angel gifts may be made through PayPal, FaithDirect or by check. Via Mail - Download the Annual Fund pledge card (to the right) and mail it and your gift directly to the school. Please make all checks payable to St. Louis Catholic School and reference the Annual Fund. If you are employed by a company which has a Matching Gift Program, you can double or even triple your gift to St. Louis Catholic School. Your Human Resources department or manager will provide you with the necessary forms to send to the school with your gift, or direct you to an online request form. Please submit the appropriate paperwork with your pledge card. The school will verify your donation with your employer to receive the matching gift. Please submit a pledge card for all payments made online so your gift is properly credited.